I’m Back – with New Creations! I know – I’ve been gone for over a month, and I’m reaaaally sorry! I have to admit – I was in a bit of a creative slump, then was busy with family visiting from Scotland – but now I’m back, and with NEW creations with NEW fabulous Stampin’ Up! products! Before I show you my first new card, I just want to remind you of the great new Hostess Benefits (posted below) if you hold a party with me. Don’t want to call it a “party”? Call it a “private class”!! Invite your friends, offer some basic refreshments (juice/tea/coffee with cookies, perhaps), and I’ll provide the entertainment (I’ve been told I have a good sense of humour! ), and the great project to make with the latest Stampin’ Up! stamps, colours and cardstocks. And if your friends place a total qualifiying order , you as Hostess get the benefits! Send me an email at debsmart@shaw.ca , or a call at 604 298 0472 to set up your party/private class today! 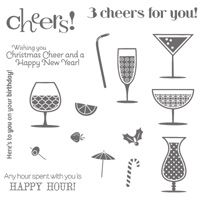 This great new set is called “Happy Hour”, and is perfect for all kinds of celebrations – Birthday, Wedding, Congratulations – it even has a Christmas/New Year’s sentiment stamp! Recipe: Base – Very Vanilla cardstock First Layer – Old Olive cardstock 1st Panel – Cherry Cobler cardstock 2nd Panel – Floral District DSP (item#126919 pg.163) Inks: Summer Starfruit (ink pad and marker), Midnight Muse (ink pad & marker), Raspberry Ripple (ink pad & marker). I stamped the ‘3 Cheers for You’ sentiment in Raspberry Ripple on a scrap of WW c/s, then cut the ends to look like a banner, and popped it, and the drink glasses, up with dimensionals. I just know that you’ll fall in love with the new ‘In Colours’, as I have! Let me know what you think – do you have a favourite new colour? I love to hear your opinion! I’ve been creating more, so I promise to post another new card again tomorrow. How cute! I bought this set for my older daughter for Christmas and she LOVES it! She put it (and me) right to work making cupcake toppers for her New Year’s Eve party! It is so versatile and she is looking forward to making all kinds of “drinks”!